This one has been a long time coming. 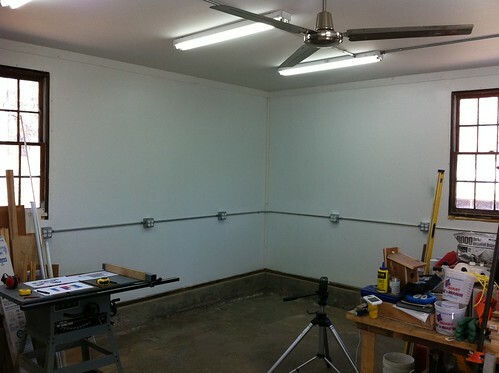 Ever since we moved into our new house I’ve been slowly turning our unfinished, unheated two-car garage into a respectable workshop… insulation, drywall, lighting, heat, climate control, etc. etc. I’ve put a lot of effort into the “bones” of the space but I’ve been hesitating to start building the work surfaces and storage. In a way it’s good that it took three years to do this, because in that time I’ve gotten to know the space through cold and hot, from woodworking and welding to painting and machining. I know where the floor gets wet when it rains a lot, and I know where the good light comes in at 7am. While I was still hesitant to commit to a design, I felt that I knew enough to take a best guess at what I need now (and what I anticipate needing in the near future) and go for it. Besides, stepping over and around piles of tools, hardware, and raw materials for three years is a miserable way to work. For me, the first step for this kind of project is CAD, and this is one of the few things for which I actually recommend Sketchup. In my experience Sketchup is a poor tool for modeling anything with curves or circles, or cylindrical or 3-dimensional surfaces. In most cases I would also prefer feature-based modeling (with a modifiable history tree) and parameter-driven modeling even for simple rectilinear objects. But I’ve modeled my house (and garage) in Sketchup for a few reasons. For one thing I’m not designing my house, I’m just modeling it– I enter a dimension once and I never need to go back and change it. The shapes are all rectilinear, almost without exception, so the surfacing shortcomings of Sketchup are irrelevant. Sketchup has a fairly good set of textures to apply to the model and I like the look and feel as you spin a model around. But I think what sold me–particularly for architectural modeling–is the ability to drop your model into Google Earth, in the right spot. At that point you can see the model in its landscape context and even play with the daylight at different times of the day and year and see how the shadows change, etc. Very cool. So I settled on an overall size and shape that would be reasonably inexpensive and worked well with my shop layout (also mocked up in Sketchup). 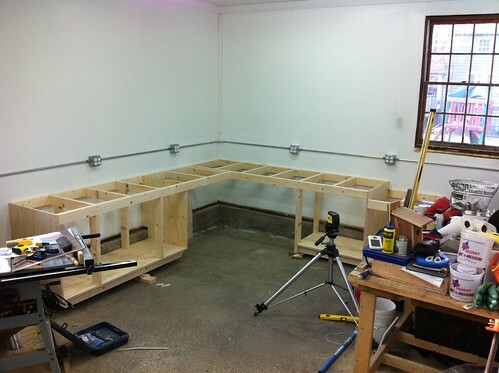 The construction is a bit of a hybrid between traditional kitchen cabinetry and a typical 2×4 workbench, with a little of my deck-building experience adding some flavor as well. 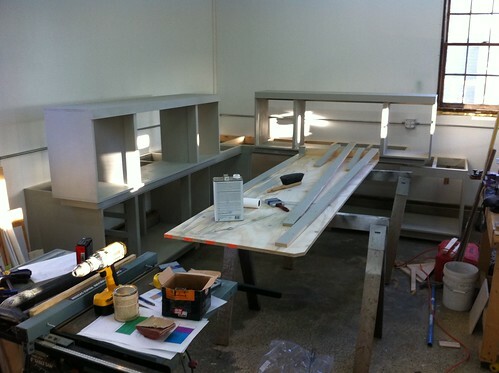 The benchtop is a single 3/4″ sheet of plywood, supported by copious amounts of 2×4 framing, finished with laminate. 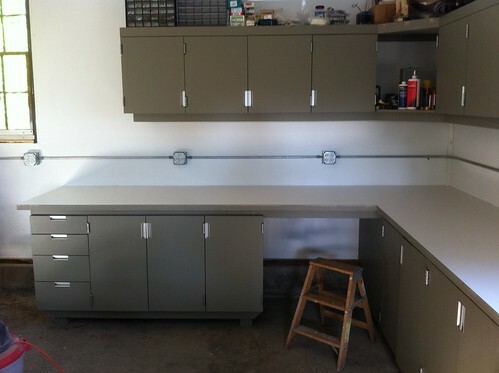 The front edge is thickened to 1-1/2″ with a second layer of plywood, overhanging by a couple of inches to allow clamping to the bench, and simply painted to match the rest of the cabinets and drawers. 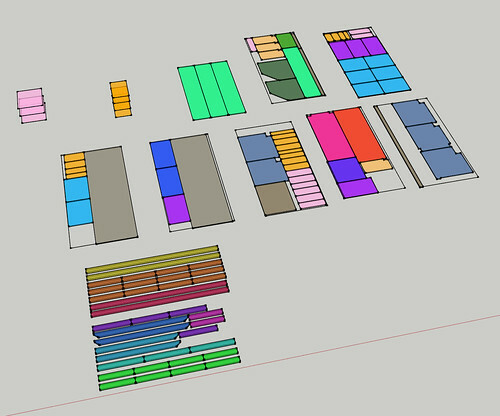 I copied each of the elements in the Sketchup model and pasted them into a single plane so I could arrange them into 4×8 sheets, trying to maximize the yield of each sheet. I did the same with the 2×4 pieces, and color coded everything so I would know which piece went where. 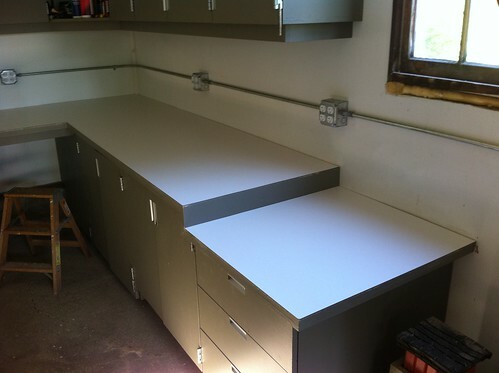 I chose AC plywood (EDIT: I actually used BC plywood) for cost reasons, knowing I would put the “good” side out and paint it, constantly reminding myself that these are garage workbenches and not fine kitchen cabinetry. Still, in hindsight I wish I had sprung for hardwood plywood, as I found that the AC sheets are not flat, resulting in some poor door and drawer face fits. Good planning leads to quick progress, and the framing came together quickly. These first assemblies were lag-bolted to the wall using a laser level for positioning, then eventually supported along the floor with small 2×4 feet. 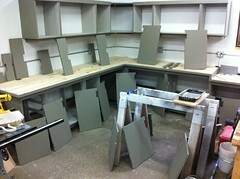 The cabinets were next, using strategically placed 2x4s for strength. 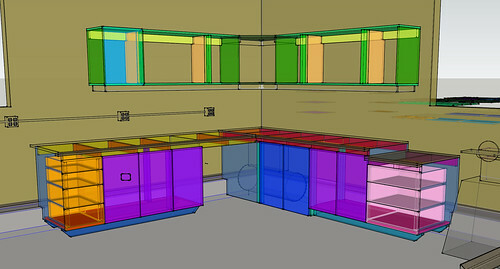 Note there are no “backs” to any of the cabinets (simplicity = lower cost). Next I primed the whole thing with Zinsser B-I-N shellac-based primer, tinted gray to more closely match the final color. Drawer bodies are not typically 3/4″ plywood but I found the small pieces were a good use of empty space on my sheets, so it turned out cheaper to maximize the 3/4″ plywood sheets than to buy separate 1/2″ plywood. 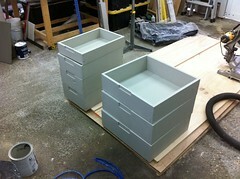 It is typical however to make the drawer face a separate part, as it makes the final fit & alignment much easier. 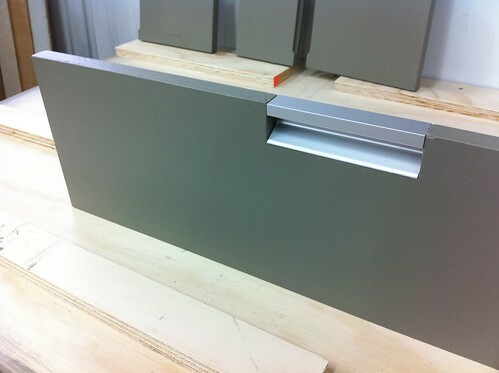 Doors and drawers were notched for a nice extruded drawer pull, which I bought in an eight foot extrusion and cut to length myself. There was some extra work (and router fixturing) involved in getting the notches just right but I think it was worth it. The final paint job was porch & floor paint in an olive-drab green. I left the insides of the cabinets in primer, as I suspect the shellac-based coating will be more durable for horizontal surfaces where things will be resting on it. The bench top is white laminate, which I’ve found is a great functional work surface– you can easily see small screws and stuff and it resists attack from glue and other chemicals. I’ve had similar melamine surfaces on my outfeed tables, which were dismantled to provide their melamine particle board for the shelves inside each cabinet. Generally I don’t trust particle board for shelves, so I cut some 1″ angle-iron, painted it white, and screwed it to the front edge of each shelf to prevent sagging. The final product…almost. The trim bit I used to rout the edges of the laminate took a bunch of paint off the front edges of the countertops, so I need to go back and touch them up. 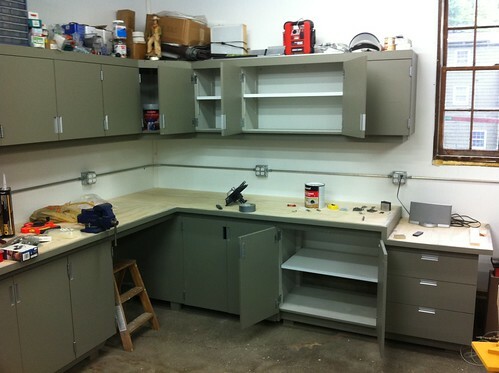 Next task: fill up the cabinets with all my shop stuff. This lowered area is for my miter saw, which matches the height of the step in the bench. This way I can let long material run across the 8′ bench to the left. 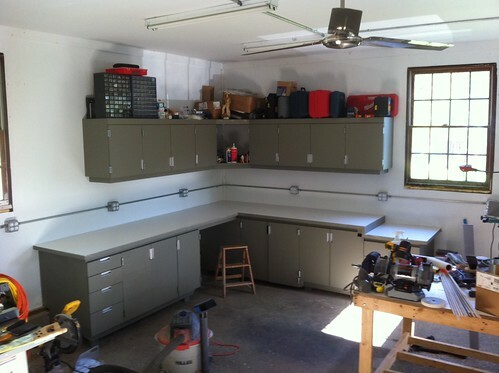 The entry 'new workbenches & cabinets' was posted on June 8th, 2011 at 9:03 pm	and last modified on June 13th, 2011 at 5:15 pm, and is filed under workshop. You can follow any responses to this entry through the RSS 2.0 feed. Both comments and pings are currently closed. Nice job, nicely documented and explained! I’m not familiar with the term ‘AC plywood’ — care to enlighten me?? Ah, stupid me: I shoulda just Googled in the first place. A = grade of one side (good); C = grade of the other side (meh, but not D).